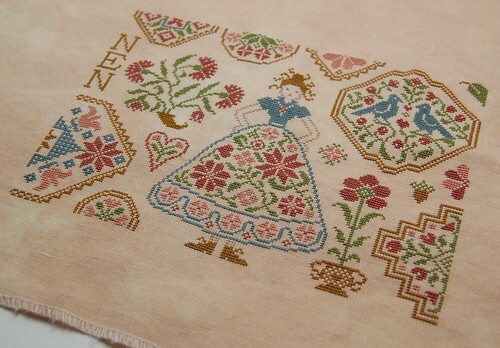 Nicole's Needlework: My Lady's Quaker Finished! I had to put Paradise Lost aside for a little bit. I need to get a couple more threads for it. So I got out "My Lady's Quaker." I was determined to finish it! Jardin Prive "My Lady's Quaker"
I'm trying to decide to what to work on now. I was thinking of getting back to "It's Berry Time," but after putting in a few stitches I decided I don't want to work on it right now. Maybe I'll get back to "With My Needle." I would love to get it finished up! Well, nothing going on here. It's just a lazy Sunday. We're all still in our P.J.s! :) Write soon! My Lady's Quaker is just gorgeous!! I love the colors you used too! I need to get back to stitching. The ragweed here is making my eyes feel so irritated that I put my stitching up for awhile and want to get back to it. A rainy day today so maybe I will stitch later on my Shores of Hawk Run Hollow. My Lady's Quaker is really so pretty! Just beautiful Nicole. The colors are so warm and I love the fabby you used. Maybe I need to purchase that pattern for my stash!! Happy stitching. Wow - Gorgeous colours! Congrats on your finish and I look forward to seeing what's on your frame next. Very pretty! Congratulations on such a lovely piece! Very pretty, Nicole. Are you going to do the partner guy, too? She's beautiful, Nicole! I love it! We're still in our jammies here too. And the son isn't even awake yet. Teenagers! lol! My Lady is gorgeous! i love the colors you chose! great stitching! She is a beauty!! Congrats on the finish. I just purchased her other half this morning. They so remind me of Elizabeth and Darcy. My Lady's Quaker is beautiful! Love it. Congratulations on your finish. Love your initials (I assume) on the side instead of ABC. Will you do Gentleman's Quaker to go with her? I have this one started, but I haven't made a lot of progress on her yet. I look forward to seeing what you work on next. Or PS "When Witches Go Riding"? Very pretty! Congrats on the finish :-). This came out so cute, I just love it. Congrats on a great finish. CJ ok;-) P.S. I vote for "With My Needle", can't wait to see it finished. Beautiful finish Nicole. I love the colours. I cant wait to see what you stitch next - whatever it is I'm sure it will be beautiful. She's gorgeous !! Love the fabric and colors you used. Nicole, what a great finish. She's so bright and lovely! Congrats! Congratulations. This is such a pretty design, and you've done a lovely job with your color choices. Woohoo Nicole! It looks great. Congrats on the finish! Enjoy your lazy Sunday. Those are the best kind of weekend days. I can't wait to see what you work on next. Great Finish !!! I am Still in PJs Too. LOL. I am taking a day of stitching for myself !!! I read you since some weeks, I'm French so sorry for my bad english, but just tell you that I like very much your stitches. Thank you for that you do. Congratulations nicole! It is beautiful. Lovely finish Amy - well done! Absolutely lovely! The colors used are so beautiful. Lovely finish! I love the colors that you picked! Congratulations on such a beautiful finish!! Hello, I have just discovered your blog and I find him(it) really extraordinary, I have too a blog and I shall be honored that you leave me one comments! What a lovely finish, Nicole! The colours are just gorgeous on this. Beautiful finish! Congrats on her!!! 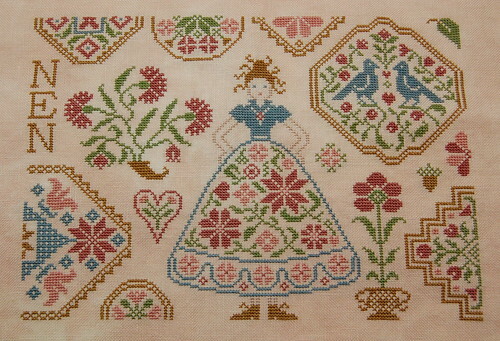 Oh, she is just lovely - will you also stitch the Gent? Your color choices are just beautiful! She looks gorgeous! Wonderful work and congrats on the finish!! She looks great!!! congrats on your finish! !